Introduction: Source localization depends on processing of monaural and binaural spatial cues. Although difficulties arising due to the deficits in the processing spatial cues are well documented in the literature, remediation programs aimed at resolving spatial deficits are scanty. 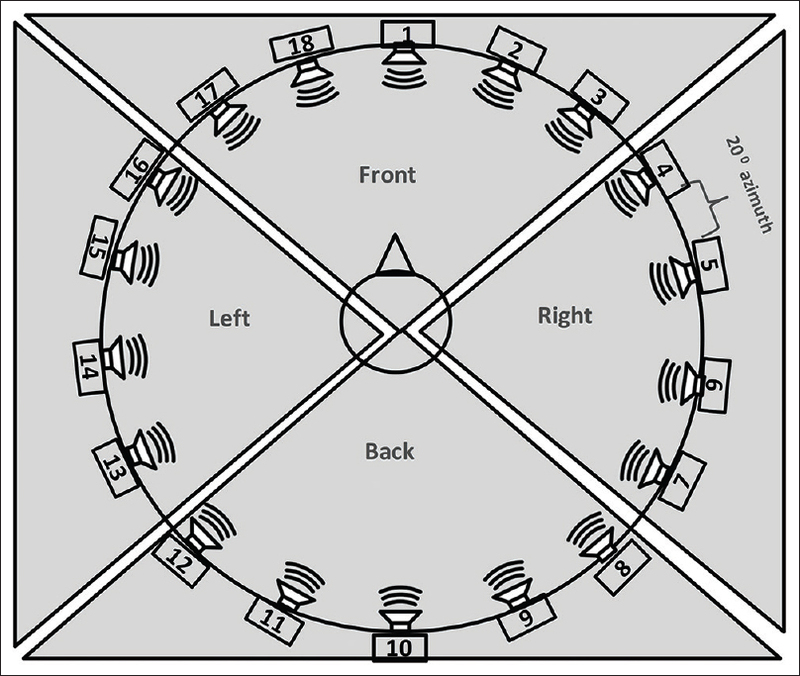 The present study is a preliminary research aimed at exploring the changes in the spatial performance of normal-hearing listeners using localization training in a horizontal plane. Methods: Twelve normal-hearing listeners aged 18–25 years participated in the study. The study was conducted in three phases including pretraining, training, and posttraining phase. At the pre- and post-training phase, three tests of spatial skills, namely, test of localization in free-field, test of lateralization ability under headphones (i.e., virtual auditory space (VAS) identification test), and tests for binaural processing ability (i.e., interaural level difference [ILD] and interaural time difference [ITD]), were administered. The training phase consisted of structured localization regimen spanning eight sessions spread over 2 weeks. Results: Paired t-test revealed that root mean square error, ITD threshold, and VAS scores in the post-training phase were significantly better than pretraining condition, indicative of the benefit derived from training. ILD did not alter significantly in posttraining phase owing to the ceiling effect in pretraining phase. Conclusion: The localization training protocol used in the present study on a preliminary basis proves to be effective in normal-hearing listeners and its implications can be extended to other clinical populations as well. Introduction: We aimed to compose a Turkish version of Amsterdam Inventory for Auditory Disability and Handicap (T-AIADH) and investigate validity and reliability of T-AIADH. Methods: A total of 240 individuals were included in the study. They were divided into two groups. Individuals with hearing disability constituted the study group (n = 120), and 120 normal-hearing individuals constituted the control group. Results: The reliability analysis of 30 items in all study population yielded a Cronbach's alpha coefficient of 0.98. All Cronbach's alpha coefficients obtained in 5 domains of T-AIADH were above 0.90. For 5-domain scores, intraclass correlation coefficients demonstrated very good test–retest reliability. There were statistically significant differences between the study and control groups in terms of the mean scores of each of the 30 items in the questionnaire (P < 0.01). The mean scores of each of the five domains of T-AIADH were statistically significantly different between the study and control groups (P < 0.01). Criterion analysis showed positive correlations between the domain scores and the average of hearing thresholds (0.5 kHz, 1 kHz, 2 kHz, and 4 kHz) in the study group (P < 0.01). Conclusion: The T-AIADH has a high internal consistency and test–retest reliability. T-AIADH can differentiate the individuals with hearing loss from the individuals with normal hearing. 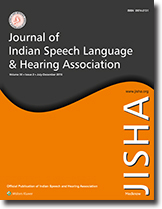 T-AIADH is composed of easily understandable questions, and it may be used to analyze hearing disability for screening purposes or as an adjunctive test to audiological tests in Turkish-speaking patients. Introduction: To determine the exposed noise levels and perceptual noisiness scores of various professionals who are prone to develop occupational hearing loss. Further, the relationship between perceptual noisiness scores and measured noise levels was assessed in the study. 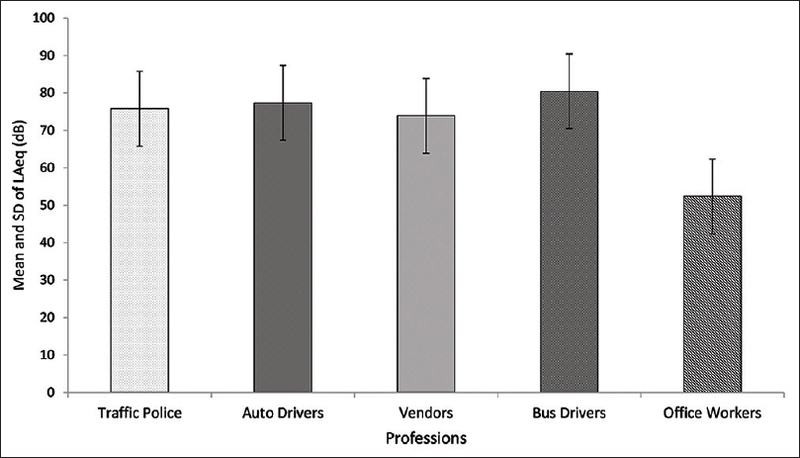 Methods: Initially, the exposed noise levels of different professions were evaluated (traffic police, bus drivers, auto-rickshaw drivers, vendors, and office workers). The “Noise at Work Questionnaire” was used to assess the noise perception scores under five different domains. Results: SPSS (version 21) was used to analyze the data. Levene test showed homogeneity of variance maintained for noise exposure levels across professionals, following which MANOVA was used. Shapiro–Wilk test for perceptual noisiness scores showed nonnormal distribution, following which Kruskal–Wallis test and Mann–Whitney U-test were performed for group-wise and pairwise comparisons, respectively. Further, Spearman's correlation for noise exposure and noisiness scores was done. The results pertaining to exposed noise levels revealed that the bus drivers (80.42 dB A) were exposed to high noise levels, whereas the office workers (52.4 dB A) had the least. In terms of perceptual noisiness scores, the results revealed a significantly better difference between the groups in the following aspects: benefits (χ2  = 18.679), barriers (χ2  = 10.828), self-efficacy (χ2  = 21.318), attitude (χ2  = 16.233), susceptibility (χ2  = 25.006). Furthermore, there was a negative correlation between the noise exposure levels and the perceptual noisiness scores. Conclusions: In spite of the high noise levels being measured, the bus drivers had the least noisiness scores among the groups, indicating negative attitudes in terms of perceptions which pose as a barrier to preventive measures. The alarming observation made was that 100% of individuals in the study had the least knowledge on the use of Ear protective Devices (EPDs). Fibrous dysplasia (FD) is a rare condition and is benign in nature. There is narrowing of external auditory canal leading to conductive hearing loss. We present a case of a 23-year-old male with a diagnosis of FD with the complaint of blocking sensation and reduced hearing in the left ear for 2 months. Canaloplasty was carried out by Wilde's postauricular incision following which there was a significant improvement in hearing threshold. This case report highlights the importance of diagnostic tests such as audiometry, tympanometry, high-resolution computed tomography, and histopathological examination. It also highlights the importance of hearing outcomes postsurgical intervention.